Courtesy of GoldenvoiceCoachella’s performances are out of this world, but logistics are a nightmare. While I loved the musical performances and felt that the event was well-organised, I probably won’t be attending again as it is too much of a pain and too much money to arrange all of the logistics necessary to attend the festival. Let’s get this out of the way: The folks over at Goldenvoice, the organisers behind the Coachella Music and Arts Festival, know how to put on a great event. 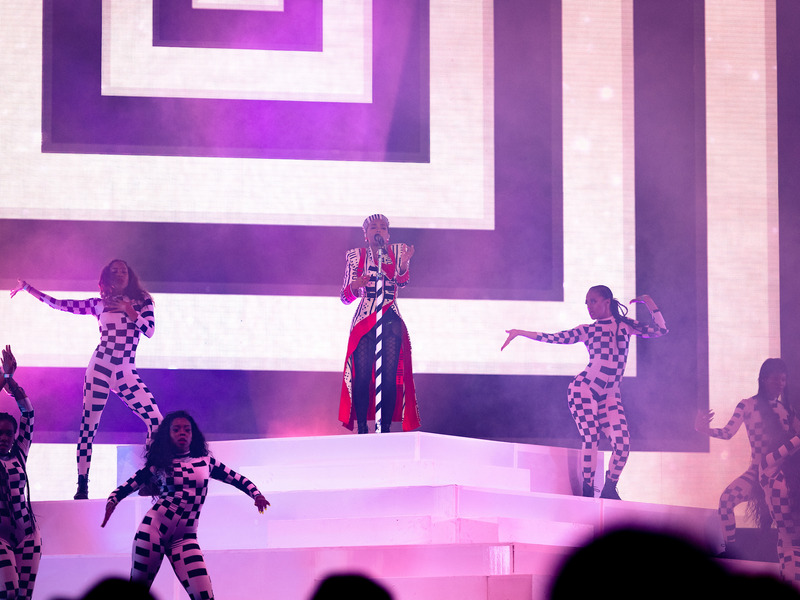 While great artists usually put on great shows wherever and whenever they perform, the atmosphere at Coachella definitely influences artists to take their performances to the next level. I got the sense that each performer took the responsibility of being on the Coachella bill very seriously. They want to blow the fest’s over 100,000 attendees – and the celebs, influencers, and industry bigwigs in the VIP section – away. The production value, from Childish Gambino having a runway that stretched deep into the crowd to Ariana Grande bringing out NSYNC, was unmatched by any other festival I’ve attended. Coachella is really in a class of its own for sheer star power and A-list talent. All that said, I probably won’t be attending again. My decision has nothing to do with how the event is organised or the quality of the art and music. It all comes down to how much of a production it is to get there. Then, on the day of the festival, I had to drive three hours (including traffic) to get to Indian Wells to pick up my wristband and drive 45 minutes back the other way to Palm Springs to check into my hotel (which was conveniently double or triple its usual price for the weekend). The only hotels closer to the festival at a reasonable price (i.e. $US300-$US400) looked like they’d seen better days. 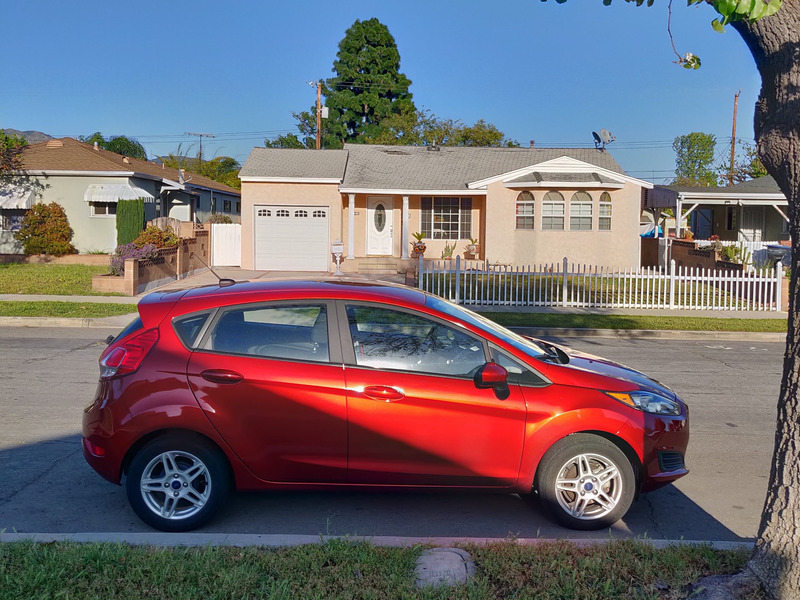 Harrison Jacobs/Business InsiderMy chariot for the weekend, a 2018 Ford Fiesta rental car. To get to the festival from Palm Springs, I bought an $US80 pass for the Coachella-approved shuttle. 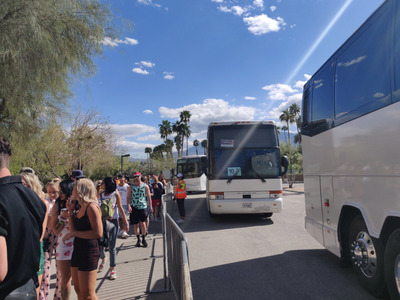 The shuttle itself is well-organised and fairly priced, but there’s no getting around the fact that it takes an hour for the shuttle to drive from Palm Springs to the festival grounds. Taking the shuttle on the way home once the music ends was a more trying experience. There’s simply no good way to manage 100,000 people exiting an event at once, but the result is that it takes an hour or more to walk with the milling crowd to get on the line for the shuttle home. On the first night of the festival, I started to leave the grounds around 1:00 a.m. and didn’t get to my hotel until after 3:00 a.m.
Skipping the shuttle in favour of Uber or Lyft is an easy way to unnecessarily empty out your bank account. It’s not much faster, with wait times exceeding one hour when the festival ends each night. Harrison Jacobs/Business InsiderThe shuttle to and from Coachella is convenient during the day and annoying at night. The best way to mitigate all this driving back and forth (and spending lots of money on overpriced hotels) is to camp onsite. But as someone travelling to the festival with only my partner and no local friends attending, it would be an even more exhausting effort to try to cobble together the camping equipment necessary to make the festival a comfortable experience. I could be one of the few to feel this way. Most of the attendees I met had travelled long distances to attend the festival, from Denver to the U.K. to Australia. One of the first things I noticed while attending was how many different languages I heard attendees speaking. Many of the attendees I met were at Coachella for the third, fifth, or even tenth time. Due to its far-out location in the desert – an admittedly beautiful canvas for a music festival – Coachella tests how much nonsense you are willing to suffer to experience some of the best performances the music industry has to offer. Add in the $US2,000 that I had to pay for lodging, car rental, flights, and other logistical extras, and it simply feels like too much effort for me to do again.